Good disaster movies are few and far between and often feel exaggerated. But after seeing actual footage of the tsunami in Japan almost two years ago it is breathe taking how real life can look more devastating than Hollywood depicts and The Impossible captures that. 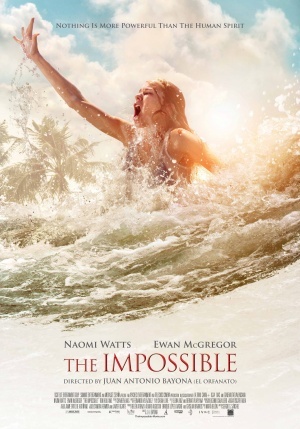 A brief introduction to the plot of The Impossible is as follows: Based on the real life experience of Maria Belon and her family caught in the tsunami in the Indian Ocean in 2004. While on Christmas vacation in Thailand their luxurious resort gets bombarded by monstrous waves pulling parents, Maria (Naomi Watts) and Henry (Ewan McGregor), apart along with their three sons Lucas, Thomas, and Simon. In order to reunite, the family must overcome many obstacles. Click here for the trailer. The first twenty minutes of The Impossible are extremely intense and gut-wrenching. Watching the water viciously knock down civilians, destroy buildings, and rip trees out of the ground crushing the thrashing civilians was flat out gut-wrenching. I could not imagine not only the physical pain of the situation but the emotional pain as well for watching your loved ones being swept away amongst all the wreckage. At this point I think everyone knows that Naomi Watts got an Oscar nomination for this movie and the acting really was top notch from all the actors. I will be honest that I am not sure she necessarily deserved a nomination. She was great, do not get me wrong. But the whole second half of the movie she lied in a bed with her eyes half open and whispered and a lot of the acting really came from the makeup they put on her when she was ill. McGregor was fantastic especially when he breaks down on the phone call to Maria’s parents. But the performance of the movie belonged to Tom Holland as the eldest son Lucas, a boy strength beyond his age. A major problem I had with the second half of The Impossible is that it loses its pace thanks to some questionable parental choices. There comes a point where Henry sends his two youngest children with a bunch of strangers in a pickup truck to head up in the mountains/hills while he stayed to search for his wife and other son Lucas. After what just happened you really want to send your kids away? Really? Then he runs into the person that he sent his kids away with in the pickup and they had no idea or care where his kids were. I am not a parent but I never would have done that nor do I think I could have done it. Since I got hung up on these choices the second half just dragged. Overall, The Impossible has one of the most jaw dropping natural disaster scenes I have ever seen and pulls at the heart strings with a remarkable true story. But the second half moved slow to me and it is worth a watch but not a movie I plan to revisit too often. I give The Impossible a 6/10. This entry was posted on March 3, 2013, 4:53 PM and is filed under Movie Review. You can follow any responses to this entry through RSS 2.0. You can leave a response, or trackback from your own site.